All political parties poll public opinion. Fine Gael is no different. It is the questions they ask rather than the answers they receive which can be most revealing. This Fine Gael online focus group poll, details revealed here today, are most revealing in that regard. But first, what’s with this ‘Let Leo Lead On’ slogan which Fine Gael is testing, obviously for its election posters? The political anoraks among you will recognise it from Fianna Fail in 1965: ‘Let Lemass Lead On’. Leo must be channelling his inner Sean Lemass again. He could do worse, I suppose. And even more disturbingly, if this slogan is adopted, does that make Enda Kenny Fine Gael’s version of Eamon de Valera, after whom Lemass led on. The mind boggles. Certainly ‘Let Leo Lead On’ is better than ‘Forward with Leo’s Team’, which has the bang of Charlie Haughey’s mohair suit off it. That said, they may go with ‘Securing our future’, but wasn’t that around before too? In John Bruton’s time, if memory serves. Maybe they should just go with ‘Prudence over Promises’, dull as it may sound. I detect Paschal’s hand in that one. The real value of Kevin Doyle’s scoop today is that it strips away the ‘spin’ and reveals what Fine Gael is really thinking. 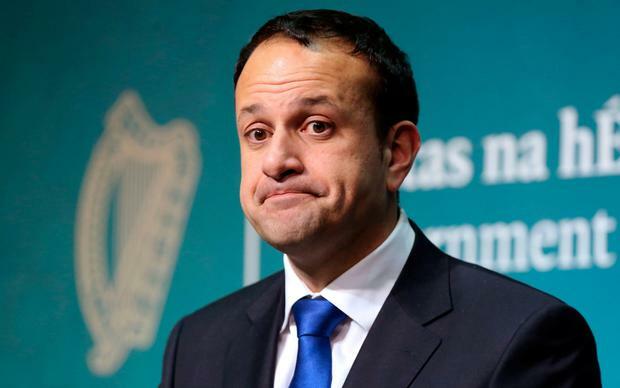 Leo said last week that he did not want an election. ‘Fail to prepare, prepare to fail’. Fine Gael will argue that one again today. But for me, the most revealing questions are the two which specifically gauge public opinion on whether Fine Gael should seek an election to strengthen its mandate in the event of a collapse in the Brexit negotiations on the Irish border; and in the event of a failure by Fianna Fail to commit to extend confidence and supply. These questions reveal two things: Fine Gael expects Fianna Fail not to extend the deal and, more importantly – even critically – that the main government party is anticipating at some level the collapse of Brexit talks and a no-deal Brexit. Of course, it would be foolish not to so anticipate. Get ready for a Brexit election, folks. As you read here first, a few months back. Interesting also is another question related to Brexit which polls opinion on whether we should “move towards a United Ireland, if this made sense following a Brexit deal”. This disclosure will hardly go down well with our DUP brethren today. Also interestingly, Fine Gael polls on the extent to which people would be more or less likely to give their first preference vote to Labour were Brendan Howlin’s party to suggest it would be prepared to go into government with Sinn Fein “under the right circumstances”, whatever they are. I imagine this question was designed to gauge public interest in a Left-led government, or a Fine Gael/Sinn Fein government, with Labour thrown in to provide political cover. By the way, Fine Gael is anticipating Fianna Fail will go with this on its posters: ‘A Shared Prosperity’. Not bad, but not as good as ‘Let Leo Lead On’, as Sean Lemass might have said. It would be interesting to know the result of the ‘shared prosperity’ question though. If it plays well with the public, it might end up on Fine Gael’s posters yet. Lead on, Leo. Lead on.